Canned salmon was and still is a staple in Alaskan manufacturing, though often the companies are owned by those out of state, usually Washington and California. These particular brands aren’t around anymore. Midcentury advertising art isn’t usually synonymous with Alaska. Manufacturing and production in the largest state of the Unites States of America has never been on the same level as the other states, partially due to a short growing season and partially due to the high costs of shipping. 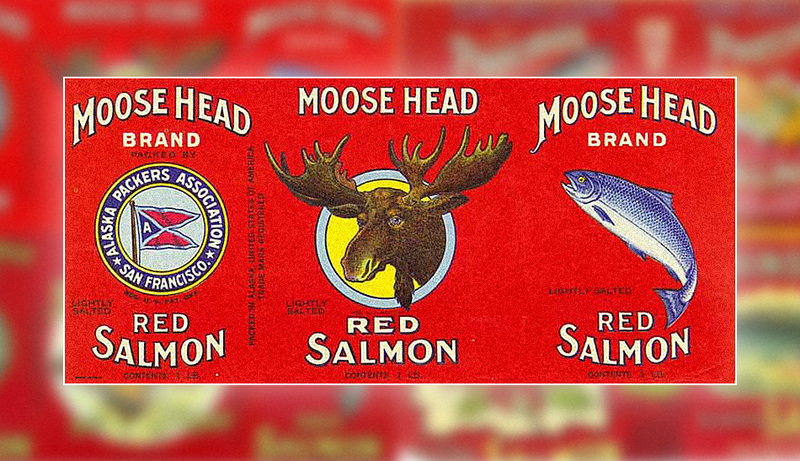 Nonetheless, Alaska has produced some goods for consumers that included: canned fish, ice cream, milk, and batteries. Despite the great distance from the “then territory” of Alaska (not made into a state until 1959) to the rest of the United States, Alaskan labels were mainly done in a midcentury modern advertising style. Since they are a rarity, midcentury product labels from Alaska are usually highly regarded by collectors. Strong Alaskan themes (husky dogs, natives, midnight sun, and salmon) run rampant among labels, helping to further propagate an exotic far north land of snow and the summer midnight sun. Above: Canned salmon was and still is a staple in Alaskan manufacturing, though often the companies are owned by those out of state, usually Washington and California. These particular brands aren’t around anymore. Above: Marlatt’s Sunrise White Enriched Bread, 1957. Sunrise Bakery, Anchorage. Closed in 2012. Matanuska Maid Milk, 1957. Matanuska Valley Farmers Co-Op Association, Palmer, Fairbanks, and Anchorage. Still Around.